I'm home from Quilt Market & finally starting to adjust back to normal life. Here is the first of a few posts to recap. 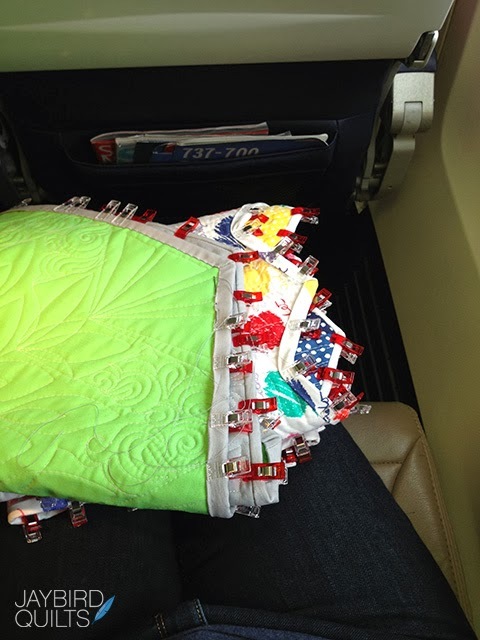 I was working up until the last minute... including finishing some bindings on the airplane! 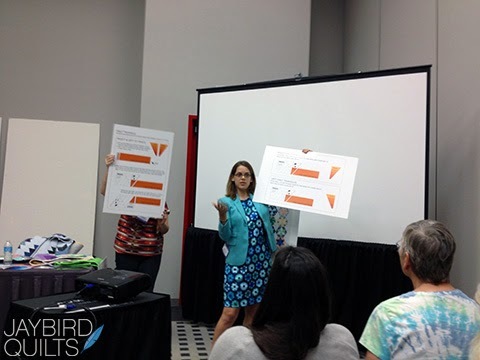 I designed some Spoonflower fabric based on my Day Break quilt and made a Staple Dress the night before I flew to Houston! 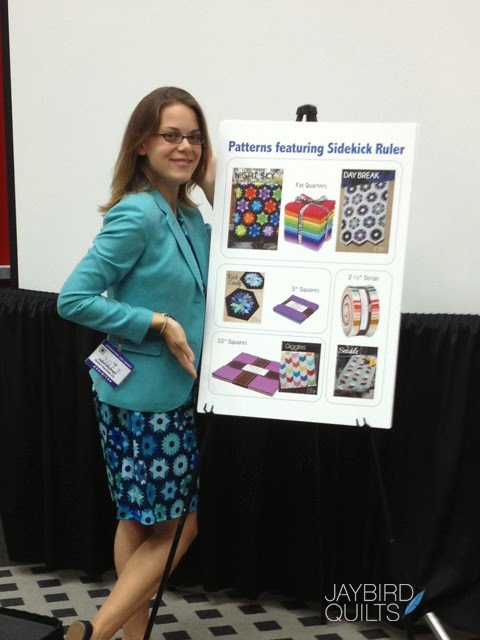 I presented a schoolhouse on the Sidekick Ruler sponsored by Robert Kaufman. Thank you to Jessica for taking all of the photos for me! You will see I talk a lot with my hands! ...and showed off a bunch of the projects. Here is Rock Candy. 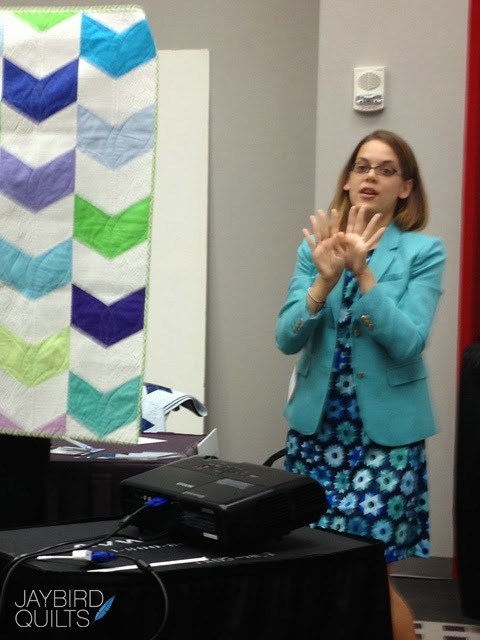 Giggles Baby Quilt... and me talking with my hands! This was the first time anyone got to see it in person since I had just finished it a few days earlier! 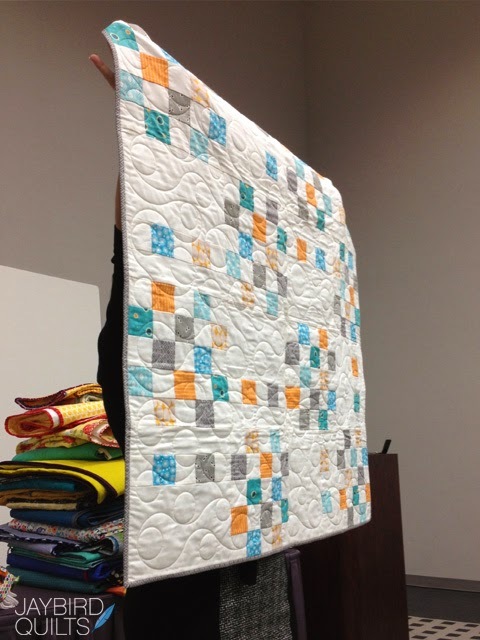 Then it was Rachel's turn to do a schoolhouse on Quilts Made with Love. 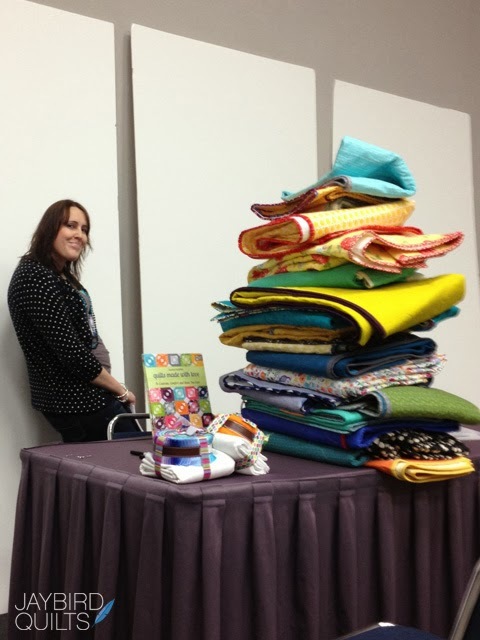 I was tempted to take one of those quilts in that giant stack! 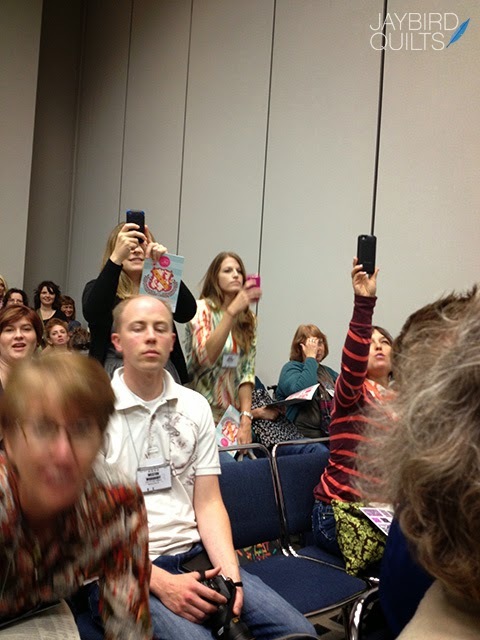 Note to self: Don't sit in the front row next time as it is hard to get photos of the quilts! 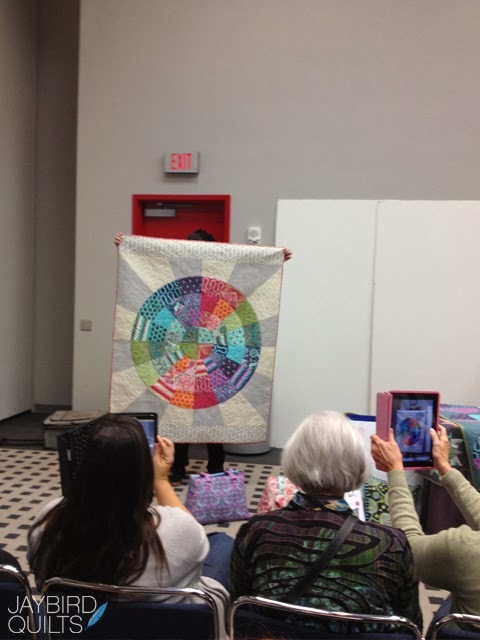 The last schoolhouse I attended was for Tula Pink. She was showing off her new collection "Fox Field" that will be in stores in March. Getting good photos here wasn't much easier. Lots of smart phone & iPads everywhere! 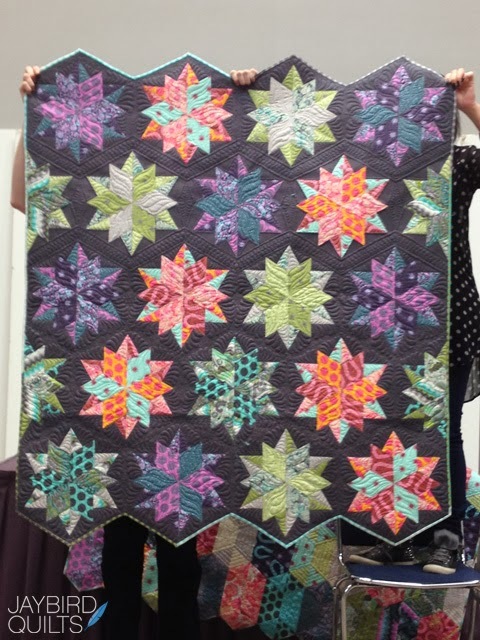 Tula Pink herself made MY Night Sky quilt. Honestly I almost cried when she asked me for the pattern so that she could make it from her new fabric! 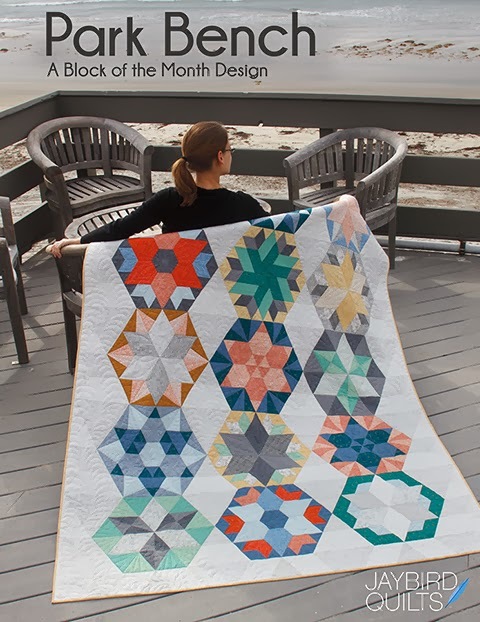 I love it so much that I plan on making one for myself just like it! 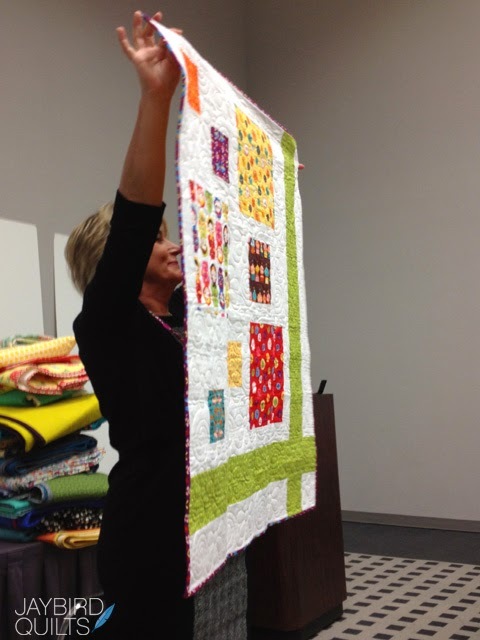 Tula also showed off the Disco quilt that I made from her new Fox Field fabric. 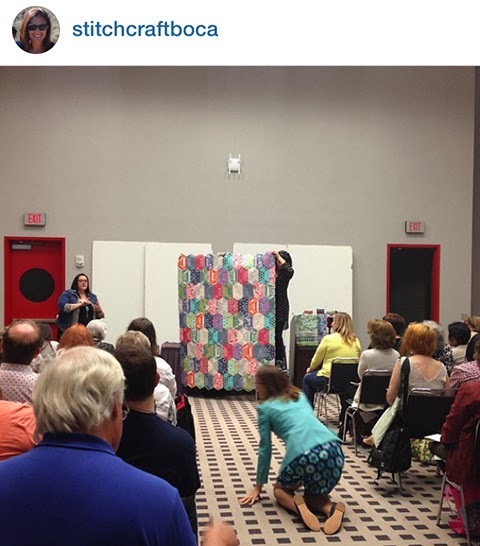 I really wanted a good photo of my quilt... so I snuck into the isle to snap a photo... and of course someone snapped a photo of it & posted to Instagram!! 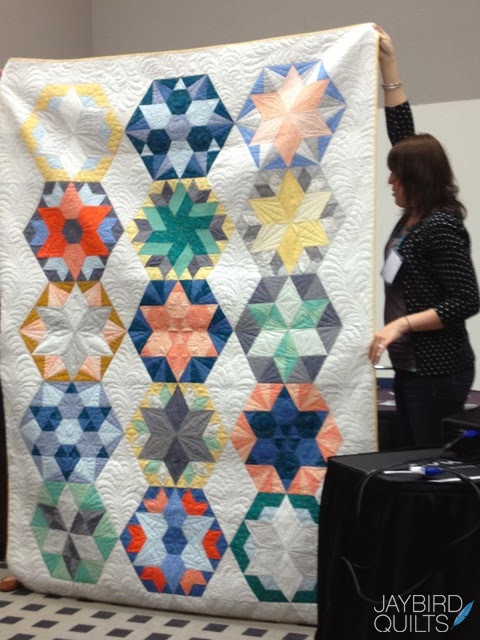 I'll be back in a few days with more Quilt Market photos! You totally rocked Schoolhouse Day in your styling custom outfit! 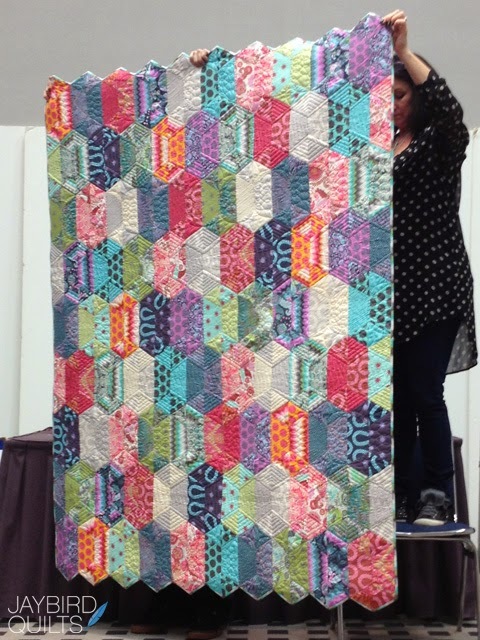 Disco quilt in Tula Pink's Foxfield is wonderful, wow, love it! I'm starting to think I could sew with just Tula Pink fabrics and be madly in love with all I create!! Just chock full with lovely colors and visual interest. You're so darn cute! Thanks for sharing all these fabulous photos. 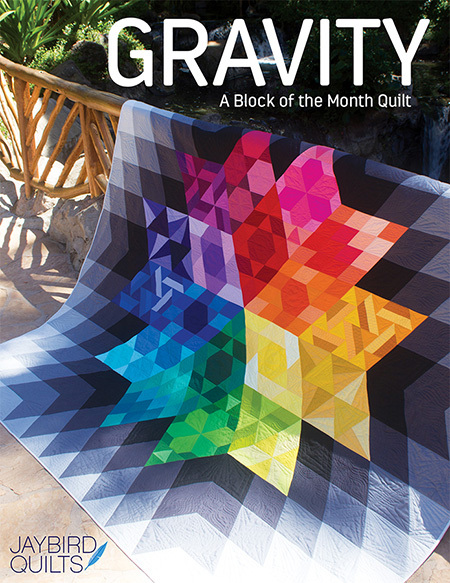 I sure wish I could have seen your quilts in person. They are all so beautiful. I really like your dress. You're such a trim little thing, I imagine you'd look good in a paperbag. 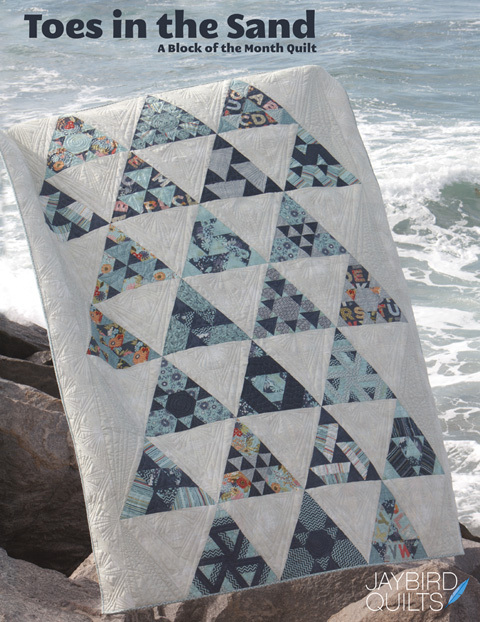 Love all the photos of quilts. How wonderful that experience must always be. 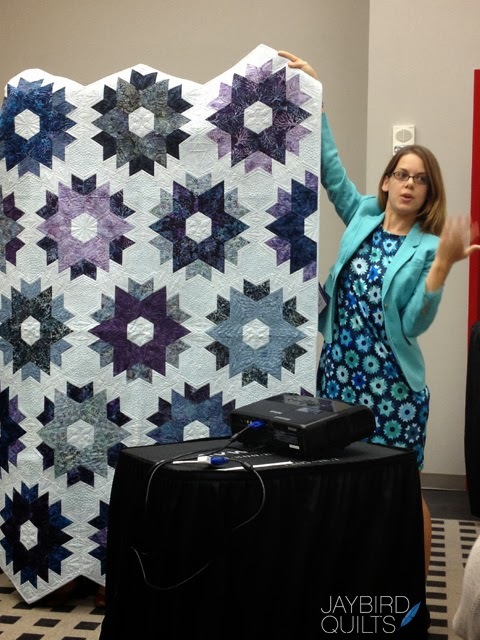 Love the dress...thanks for sharing QuiltMarket with us! Fun to see all I can use that new ruler on! 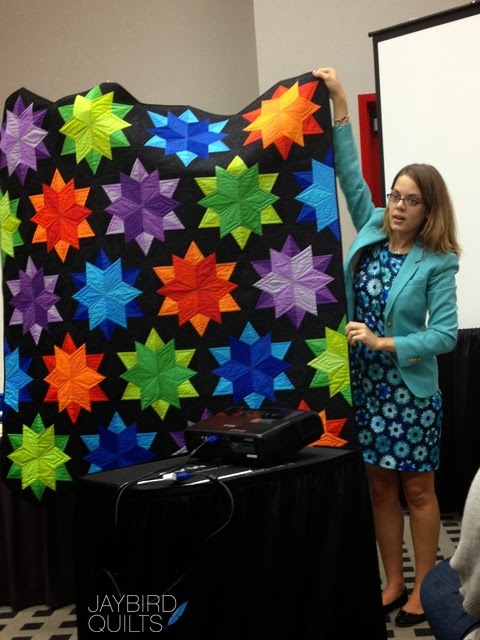 Wow all the quilts are so beautiful thanks for sharing! Awesome stuff! Thanks so much for sharing and congratulations. 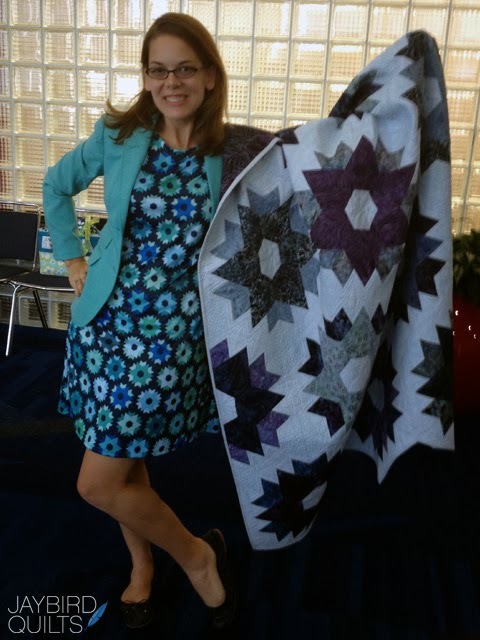 Love the dress AND all of the quilts! I love the dress! I went ahead and ordered the pattern because I was intrigued with it the last time you posted photos of the dresses you made with it. Did you skip the shirred waist this time? 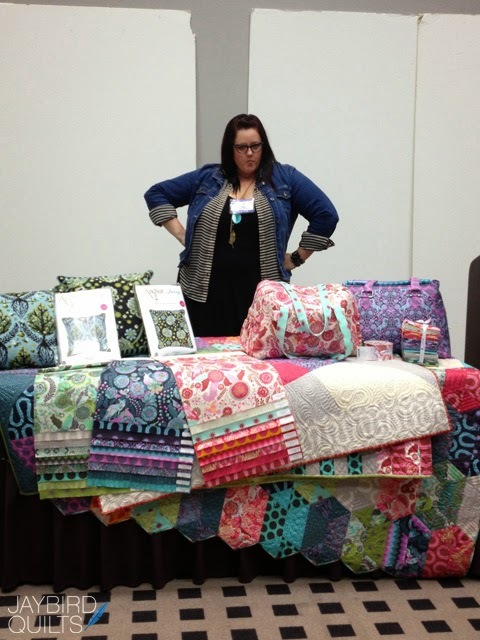 Love all the pictures from Quilt Market! You are so talented! I'm not "old", by any stretch of the imagination, but I am so excited to see so many young women sewing. I have 3 daughters who don't sew and have no interest in it. I'm surprised I love it so much. 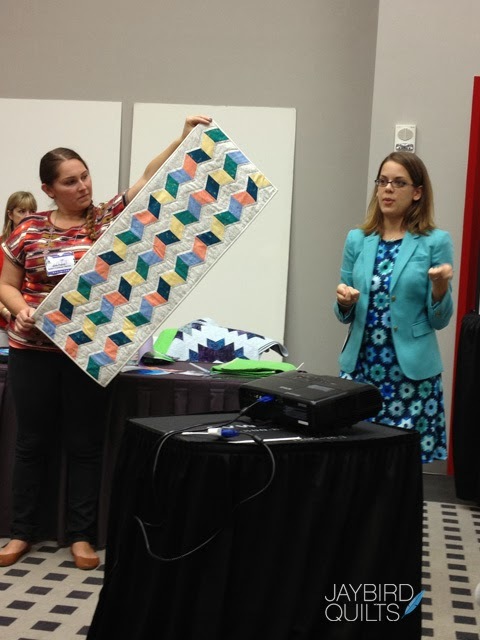 Your creative designs and fabric selections are amazing. I enjoy following your blog and career. Oh my goodness I LOVE your dress! Yes, you're very expressive with your hands! LOl & we're blessed with what those hands develop! Night sky is my favorite. 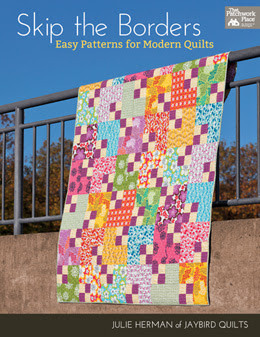 can't wait to get to try the new rulers & patterns. 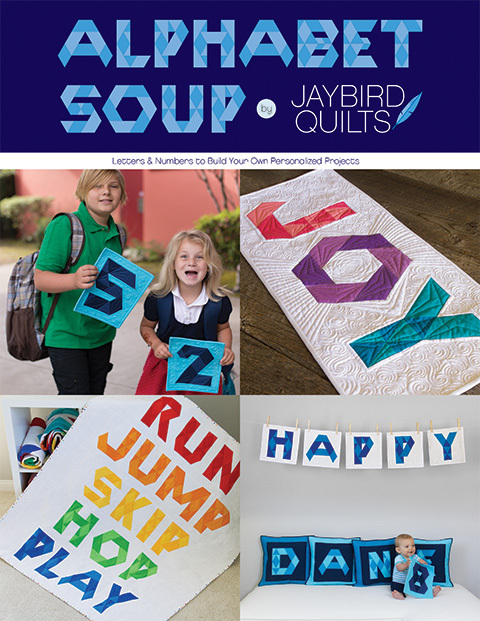 They're here in our store but customer quilts come first! Happy Thanksgiving! Love all of it! Especially the custom fabric dress. Fantastic work, I am still so proud of you and amazed with all you are doing! Great work! I just died laughing!!! The IG pic of you is awesomeness!!! Hahahah! 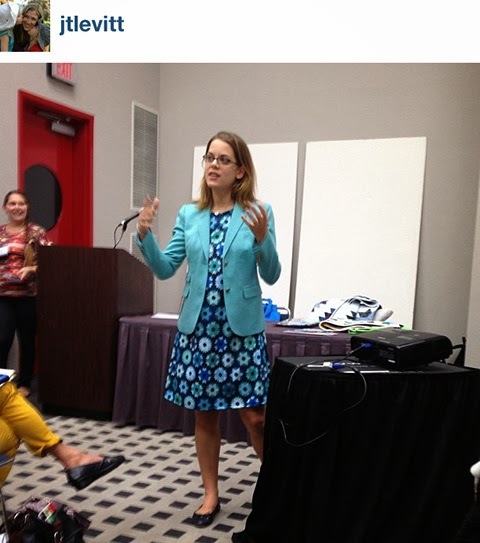 Love your dress, really lovely with the Spoonflower fabric - clever idea. 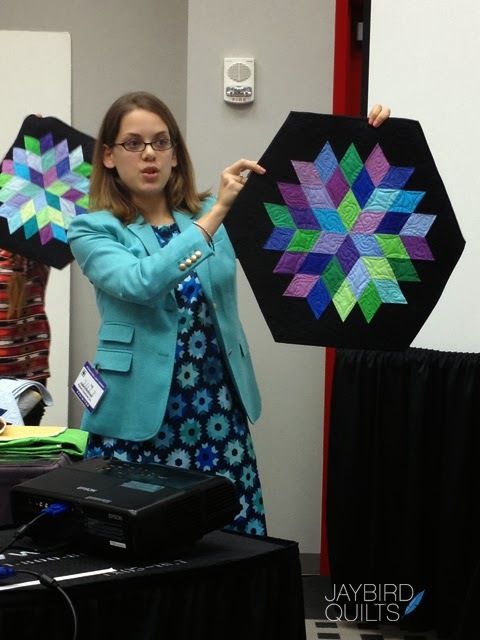 And you also design amazing quilts - so much talent! 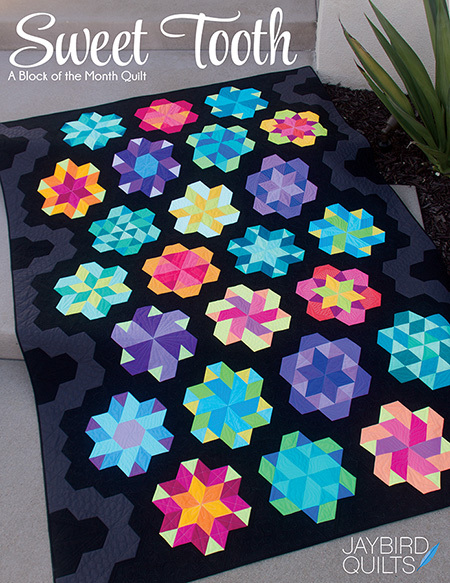 Quiltmaker's 100 Blocks Volume 8 giveaway winner!